White_2Pay_3_Coin_Envelopes_-_2_12_x_4_14 is rated 5.0 out of 5 by 1. Rated 5 out of 5 by KarenDP from Exactly what we were looking for! These envelopes were needed for our upcoming wedding and they arrived quickly and just as advertised. I am very pleased with JAM paper and the quality of its products. 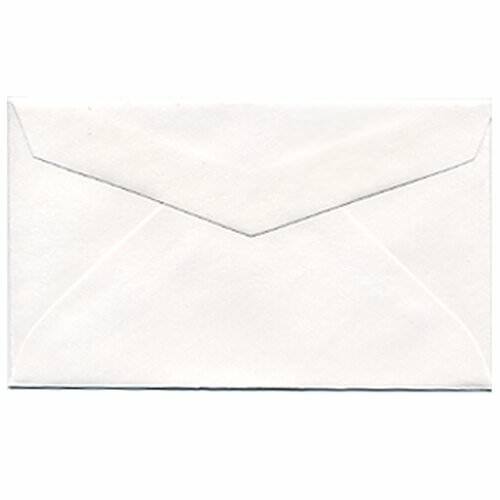 White 2Pay and #3 Coin Envelopes are a slim fit envelope which work well for letters and cards on the smaller side of things. Horizontal 2Pay Envelopes and their vertical #3 Coin counterpart are often used for storing change, jewelry, drivers licenses and smaller sized cards. Pair these tiny envelopes with a petite gift or a beautiful bouquet of flowers - it will make for the perfect accessory to any item. Also, this classic white color is very easy to write on or decorate with style. So whether you want to add a small card in any color, or want to decorate the outside with as many markers as you want, this white 2.5 x 4.25 envelope will be the perfect and classy answer. White 2Pay and #3 Coin Envelopes measure in at 2 1/2 x 4 1/4 and feature a gummed V-flap. They are available in a plain white or a translucent clear. They can be ordered in increments of 25, and once you hit 100 you'll save money! So why not, right?